It's All In Your Head: Dream Big! Nothing is impossible. The word itself says I'm possible! Imagine the reaction of people when the Wright Brothers said they were building a contraption that would allow men to soar through the air. I expect they were gossiped about and laughed at regularly. Then, imagine how satisfied they felt after that first flight. Orville's telegram read: Success. Four flights Thursday morning all against twenty one mile wind. Started from level with engine power alone. Average speed through air thirty one miles longest 57 seconds. Inform press. 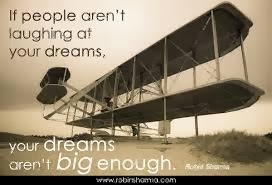 The next time you share your dreams with someone and they laugh and tell you it will never happen, remember the Wright Brothers and Thomas Edison and all the other people whose big ideas changed the world. Never let someone tell you can't. Unless they can predict the future, they just don't know. Believe in yourself and you can go as far as you can dream.